Ethnic or racial animosities have become more pronounced in countries such as the United States and India partly because of the negative role played by segments of the social media. MALAYSIANS, whatever their religious or ethnic backgrounds, are grateful that no lives were lost in the fracas that erupted at the Sri Maha Mariamman temple in USJ 25 in Subang Jaya on the 26th of November 2018. However, a firefighter deployed to attend to vehicles set on fire near the temple was attacked by a frenzied mob and sustained life-threatening injuries. Muhammad Adib Mohd Kassim has been hospitalised and is now reported to be in a stable condition. We pray for his complete recovery. 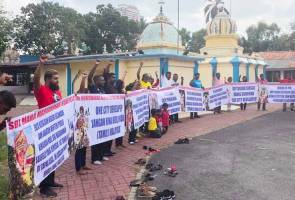 It is also significant that Malaysians are unanimous in maintaining that the temple fracas had nothing to do with religious or ethnic issues though it has created some uneasiness within the community. It appears that the temple’s relocation which is an issue that has been festering for a while is the underlying cause for the disturbance. An amicable solution which respects the integrity of a house of worship will have to be found through mediation and negotiations as soon as possible. The immediate and urgent task before the authorities is to conduct a thorough investigation into the 26th November incident. They should not only punish the culprits but also determine who the master-minds were. The manipulators of the fracas should be dealt with severely in accordance with the law. Prime Minister Tun Dr Mahathir Mohamad has given this assurance to the Malaysian public. The temple fracas has also brought to the fore a tendency within Malaysian society which has already expressed itself a few times before. Whenever an issue assumes an ethnic or religious colouring, the social media more often than not provides interpretations which are one-sided, biased and prejudiced. Social media discourse of this sort exacerbates ethnic ties. It generates antagonism. It intensifies distrust between communities. Malaysia is not the only country in the world where this happens. Ethnic or racial animosities have become more pronounced in countries such as the United States and India partly because of the negative role played by segments of the social media. Through interaction with groups in other societies we may develop a better understanding of this phenomenon which in some ways is a new challenge facing multi-religious and multi-ethnic societies in the 21st century. * Dr. Chandra Muzaffar is the Chairman of the Board of Trustees of Yayasan Perpaduan Malaysia (YPM).